KEF KHT3005SE 5.1 speaker package goes wireless | What Hi-Fi? It has exactly the same satellites and centre speaker as the Award-winning KHT3005SE, with their Uni-Q 11.5cm driver and die-cast aluminium cabinets, but adds a 250W HTB2SE-W wireless subwoofer. The sub can be placed vertically or horizontally, has a 250W Class D amplifier, a 25cm driver and bass boost and phase controls for fine-tuning the sound to your room. A wireless transmitter connects to your AV amp or receiver and sends the bass frequency signals to the sub, which can be placed wherever you want it. 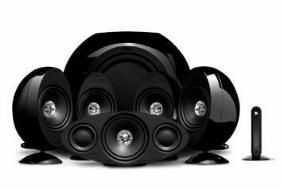 Find out more about the latest KEF KHT speaker packages in our previous news story.